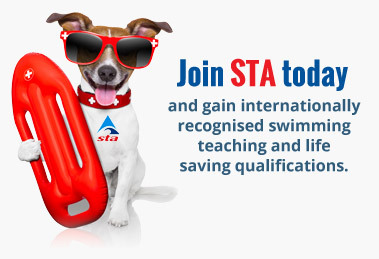 As the world’s largest swimming teaching and lifesaving organisation, all STA’s qualifications are recognised internationally with IFSTA (International Federation of Swimming Teachers’ Associations). With 80 years of frontline experience, STA remain at the forefront of swimming and aquatic teaching in the UK. The reason why I have became STA Tutor was to share my teaching joy with others. Being a teacher is really awarding role, especially when working with small children. Whether this is your yet another swimming qualification you aim to achieve or complete change of your career, I will do my best to show you this can be an amazing experience. During my courses I make sure you are comfortable and confident with both, teaching and following lifesaving procedures. Please do get in touch if you wish to sign up or find out more. The Baby and Pre-School qualification aims to produce teachers that can teach aquatic activities, including paddle strokes to babies and pre-school children during adult and children lessons, and deliver the STA Starfish programme, as well as the Teddy Bear awards and up to the STAnley Series of STA’s International Learn to Swim Programme. This qualification does not require revalidation. However, STA recommends all members attend or complete CPDs to continuously update their knowledge and skills. 15288 Part 2, Safety Requirements for Operations. 6 Recommended Guided Learning Hours. - Demonstrate cardiopulmonary resuscitation, its preparatory actions and aftercare. This qualification requires revalidation every 2 years to update knowledge and demonstrate understanding. Membership of STA is mandatory for cadidates enrolling on STA Aquatic and Swimming Teaching courses. During your course you will be required to participate in a variety of practical sessions. The Safeguarding programme aims to train learners in matters of safeguarding the wellbeing of children, young people and vulnerable adults.